Our friend, Courtney Maum is currently taking submissions for her Sept 2018 retreat. 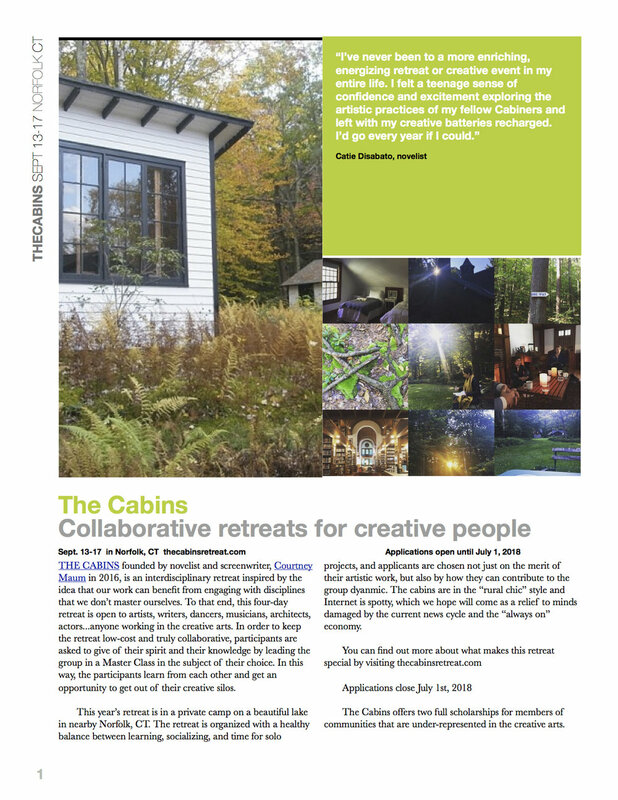 As a reminder, The Cabins is a low-cost, four-day interdisciplinary retreat and peer-based knowledge exchange program in Norfolk, CT. Everyone who is accepted teaches a 45-minute master class in the subject of their choice—that's how our participants end up getting a lot out of a short program. (Our best friend, Kelli Scarr taught a sound bath master class- watch out for more from her in our SOUND ISSUE. )They learn from their peers, learn from putting themselves in a position where they have to teach something, and they learn how to expand their own creative discipline from learning about someone else's. Add to this the fact that participants are housed in wood and stone cabins on a gorgeous lake in the middle of the Great Mountain Forest with a private beach with canoes and kayaks at their disposition.